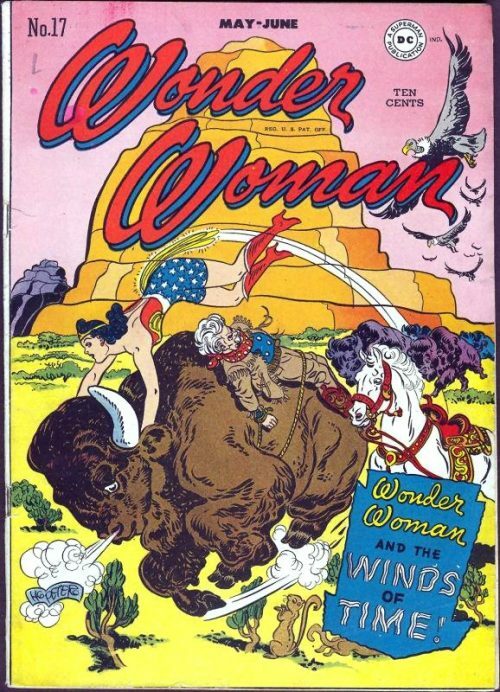 The story opens on Paradise Island, where Wonder Woman is staring in horror through a large telescope. The view she sees is of a gaseous, Red Planet encircling a white star and totally absorbing it. She realises that this cosmic menace will continue on its path until it reaches Earth, when the Red Planet’s gaseous rays will pierce our world’s atmosphere, causing it to disintegrate! Suddenly, Paula, the chief Amazon Scientist calls Wonder Woman over to the omni-screen, where the image of a stranger is displayed, talking in some unidentified language. Paula asks the Amazon Princess, who is versed in all languages, if she understands the message and she replies that the stranger is Crystallar, King of the White Star. The king is apparently sending out thought waves in the hope that someone will come to the aid of the White Star people, known as the Genii, who are being enslaved by the dreaded Golden Women of the aforementioned Red Planet. 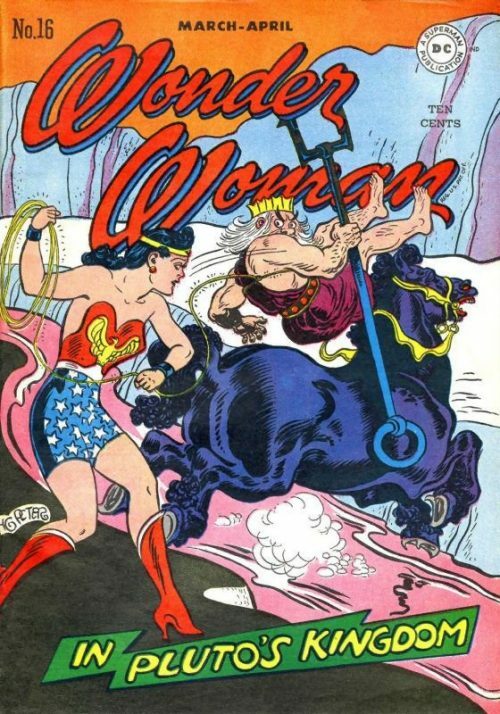 Wonder Woman asks Paula whether there is anyway she can resist the deadly rays of the Red Planet so that she can go to the king’s assistance. Paula sprays her with Hydronitgin, which forms a solid membrane around her body to protect her. After several other Amazons are sprayed with the substance, they join their Princess on the rescue mission. Now protected by the membrane, they are fired up into space from a space cannon towards the encircled White Star. As they draw nearer, Wonder Woman surmises that the Red Planet must contain vast amounts of breaking atoms which, when their energy is released, hits the atoms of its target planet, breaking them up. She realises that they must stop it before it turns Earth into an exploding bomb! Suddenly, the Amazons are sucked into what looks like a giant vacuum cleaner nozzle and plummet down the tube towards the planet’s surface. Eventually, they land inside large, individual test tubes within a dark receptacle, and as the tubes are sealed they find themselves trapped. As the tubes are then lifted out into a huge dungeon area they are met by the Golden Women, lead by their queen, Supreema. She says that she had issued orders for all Genii to remain on their own planet and that they had disobeyed that order. When Wonder Woman tries to explain that they are, in fact, Amazons from Earth, she is silenced. Just then a booming voice instructs Queen Supreema and her Golden Women to report to the communications room at once for an important incoming message, which they promptly do. 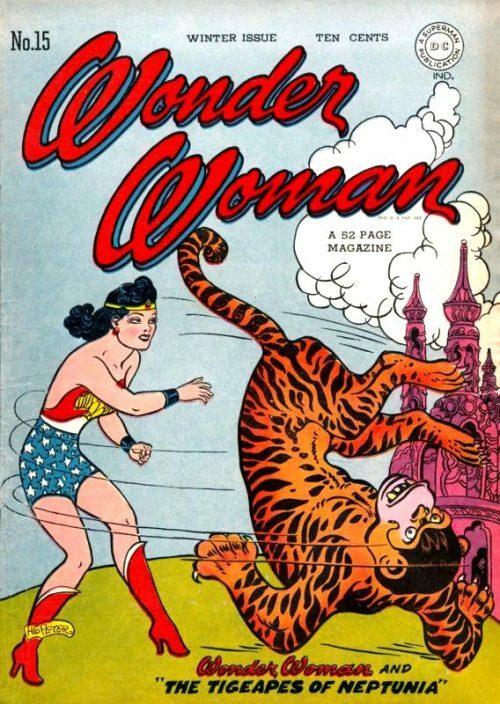 As soon as they have all left the dungeon, Wonder Woman smashes out of her tube and discovers that the atmosphere is much heavier than Earth’s. As she frees the others, she instructs them not to try and walk, but to swim for the window through the air. Meanwhile, as the Amazons make their break for freedom, Queen Supreema and her Golden Women listen intently to the message being received. It originates from the Planet Pacifico, head of the interplanetary peace organisation, and it is revealed that the Golden Women are actually interstellar police who were tasked with bringing king Crystallar to justice. Apparently, the deadly atom disintegrating rays in fact originate from White Star and not the Red Planet. Queen Supreema is advised that the king had managed to send a message to Earth requesting help, falsely claiming that he was being attacked by the Golden Women. She realises that the women they had captured were not Genii spies after all, but really were from Earth. Rushing back to the dungeon , they find that the Amazons have already escaped. They realise that the Earthlings are under the misapprehension that the Golden Women are evil when in fact it is king Crystaller who is the villain, and who will use the Amazons to fight against Queen Supreema and her officers. Desperately, they try to use the inhilerator, the same device originally used to capture the Amazons, to retrieve them. 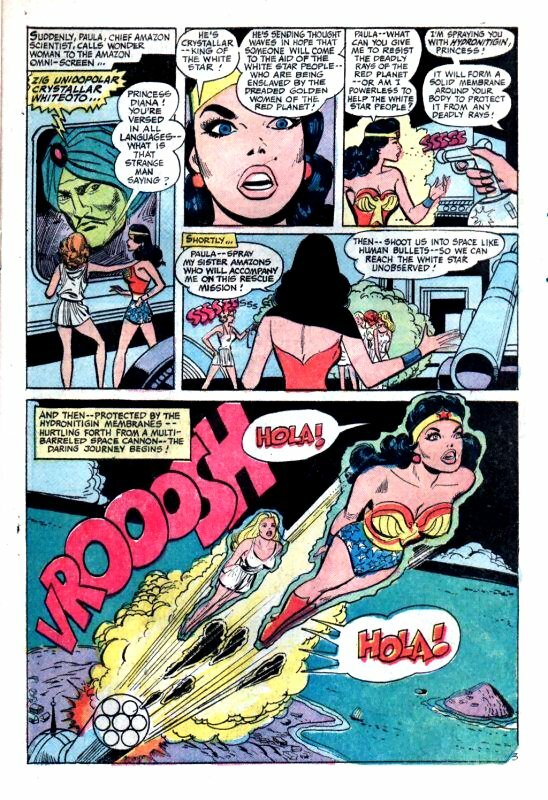 Meanwhile, Wonder Woman and her sisters have almost reached the great barrier between the atmosphere of the Red Planet and that of the White Star. Suddenly, they feel the incredible suction of the inhilerator, but Wonder Woman manages to crush the nozzle allowing her and the other Amazons to make the crossing. 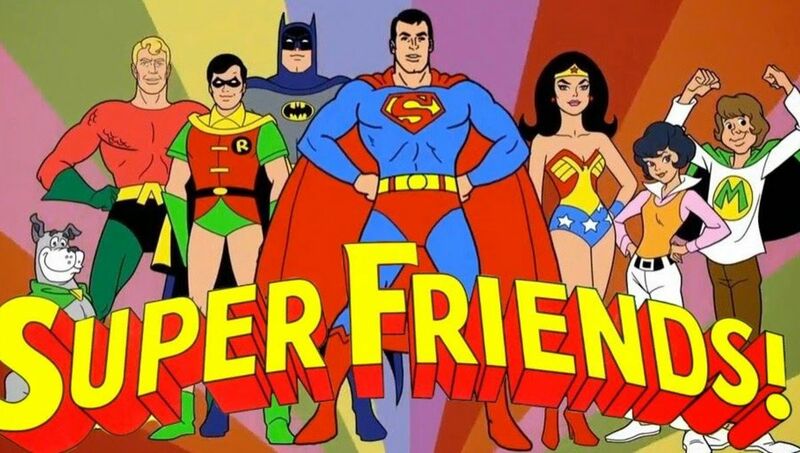 Soon they arrive at the king’s palace and Wonder Woman announces that they have come to assist him and his people to free themselves from the tyrannical Golden Women. She explains that the Amazons had managed to escape the women’s’ evil clutches by destroying the inhilerator. On hearing this, King Crystallar begins to laugh maniacally. Wonder Woman, hearing the evil tone in that laugh, begins to think that perhaps she has made a mistake and that perhaps she is trying to help the wrong people! Sure enough, the king explains that he has tricked the Amazons and that now the inhilerator has been destroyed, he can make a move on the Golden Women. Before setting off, he throws some atomic crystals at the horrified Amazons, telling them that their own atoms will now explode and as he departs he hears the crystals explode like firecrackers! Followed by his people, he prepares to storm the castle of the Golden Women. Queen Supreema sees his advance and realises that they are now defenseless against the exploding crystals without the inhilerator! 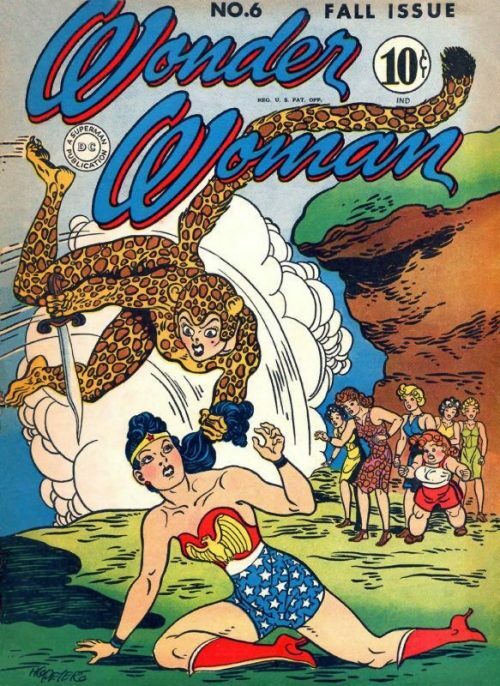 Meanwhile, Wonder Woman and her sisters, who had been protected by their Hydronitgin membranes, quickly recover and set off after king Crystallar, who they now realise must be stopped before he kills the Golden Women. As the Amazing Amazon confronts the evil king, he throws more crystals at her but she effortlessly deflects them with her bracelets. Then she quickly lassos the king with her magic rope and commands him and his men to surrender. 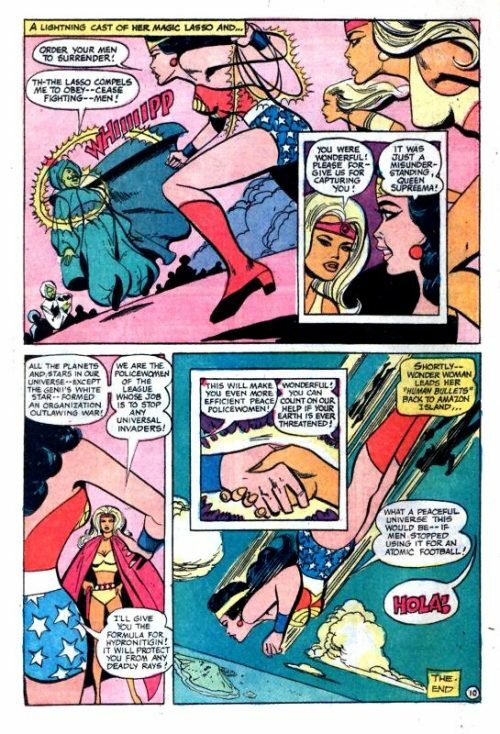 A thankful Queen Supreema asks Wonder Woman to forgive the Golden Women for capturing them and the Amazon Princess replies that it was all just a misunderstanding. The queen explains that all the planets – except the White Star – had joined an organisation outlawing war and that the Golden Women are the policewomen whose task it is to stop universal invaders. Wonder Woman offers them the formula for Hydronitgin so that they will always be protected from deadly rays. With that, they shake hands and the queen tells her that if the Earth ever needs them, the Golden Women will always be there. This tale begins once again in the laboratory on Paradise Island, where Wonder Woman and her mother are having a new device called the Multi-Scanner demonstrated to them by another Amazon named Nurka. On the large viewing screen, the skyscrapers of New York can be seen, even though they are 4700 miles away. Wonder Woman asks what magnification powers the device has and Nurka responds by zooming in on a particular building and then a particular room to reveal an interesting scene. The next day, Wonder Woman decides to fly to New York in her invisible plane to find out to what use the Reduso Liquid is put. After traveling at lightning speed, she arrives at the laboratory and climbs through the window, to discover Roy holding a bidding session for the formula, starting at $5,000,000. When he sees the Amazon, he tells the interested buyers in the room that if they want the formula they will have to kill Wonder Woman first. 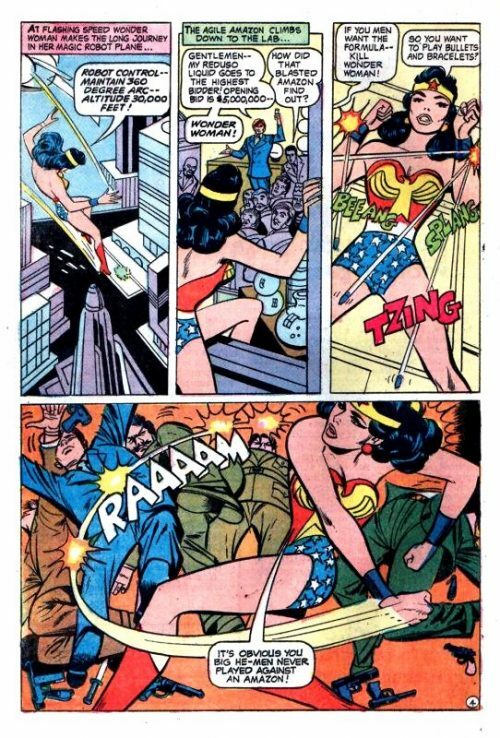 As they open fire, Wonder Woman deflects the bullets with ease and sends her attackers flying with a powerful punch. Suddenly however, Roy sprays the Reduso Liquid at the surprised Amazon and she immediately begins to shrink! As he attempts to squash the fleeing Amazon with his boot, he tells the others that Mary and Phillip, who is secretly in love with her, have also been shrunk and are trapped in the room. He tells them to hunt the three of them down and then the bidding can resume. Wonder Woman makes her way through what looks like a Redwood Forest, but which is actually the green carpet of the lab floor. All of a sudden, she sees Phillip plummeting down from the sky, having tried to climb up one of the massive carpet fibres to get a better view. She manages to catch him in time and he tells her that he and Mary have become separated. Suddenly, they hear a cry for help, and racing to the spot they discover Mary trapped underneath a shirt button which has fallen on her. 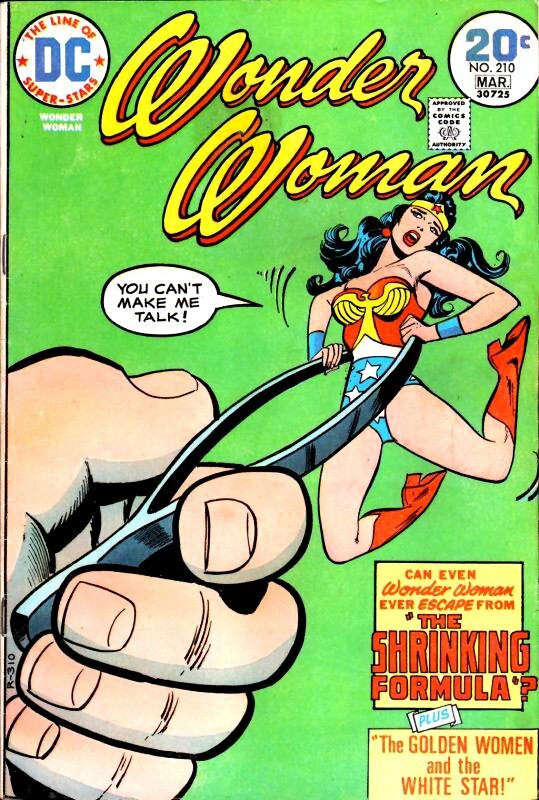 Wonder Woman quickly frees her but they are immediately confronted by a massive fly. Using the button, the Amazing Amazon hurls it at the insect, knocking it out. Wonder Woman tells Mary that they have to stop the Reduso Liquid falling into the wrong hands and asks whether there is an antidote to the formula. She replies that there is some inside an eye dropper on the lab table but that it has not been tested yet and could be fatal. Just then, a giant microscope pushes through the carpet ‘forest’ towards them as Roy tries to find his quarry. Quickly, Wonder Woman launches herself at the lens, shattering it instantly and leaving Roy with a stunned eye. He realises that it will be very hard to find them now and comes up with a plan to liquidate them. Shortly afterwards, Roy and the others start to spray the carpet with alcoholic fumes which will have a lethal effect on their microscopic quarry. 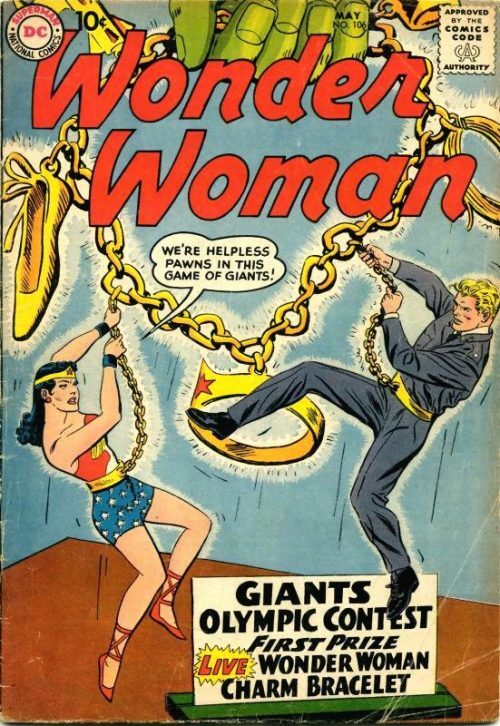 As Wonder Woman, Mary and Phillip begin to choke on the deadly fumes, the Amazon realises that their only hope is to return to normal size quickly. With an amazing leap, she jumps up onto the table towering above them and picks up the eye dropper containing the antidote. Just then one of the men in the room sees the eye dropper appear to rise into the air all by itself and Roy realises that it must be being carried by Wonder Woman. Quickly, he sprays her at point blank range and she has no choice but to take the antidote there and then, or die. As she manages to squeeze a droplet of the antidote out, she finds herself drowning inside the huge balloon of liquid. However, she instantly begins to grow and within seconds returns to her normal size in front of the horrified room of men. Her magic lasso makes short work of them and soon she has returned Mary and Phillip to their normal size also.